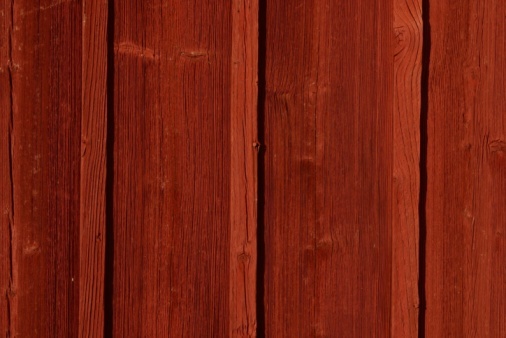 Faux or fake wood paneling was a very popular wall design in the 1970s. Like many designs and styles from the '70s, fake wood paneling's popularity did not last, leaving many homeowners stuck with a wall or surface that looks like a poor combination of wood and plastic. Removing fake wood panels can be tedious and expensive. In most cases, your best option is to paint over them. Painting over fake wood panels requires a few more steps than painting a typical wall. Clean the panels thoroughly with a soap and water. A dish detergent works fine in most cases, although you may need to use a stronger solvent for heavily soiled panels. Use a sponge to clean the panels, and then dry them with a towel. Prepare the panels for painting. Most panels have glossy finishes, so you will need to use sandpaper to lightly sand them down. Liquid Sandpaper is available in most hardware stores, requires no scrubbing or sanding and works wonders on fake wood panels. Wipe any shavings or residue left on the wood panels after you have sanded them or used the Liquid Sandpaper. Wipe them thoroughly to avoid imperfections from coming through your paint. Apply a normal coating of primer. Latex primer will work best for painting over fake wood panels. If you can still see through the primer, apply a second coat after the first one dries. Paint the panels with your choice of paint, as you would any other wall. Once you have the primer on, the rest is easy.